Macarons, indeed! I am reminded that this long American holiday weekend would be a good time to put my almond flour to good use with a few batches of these little delights. 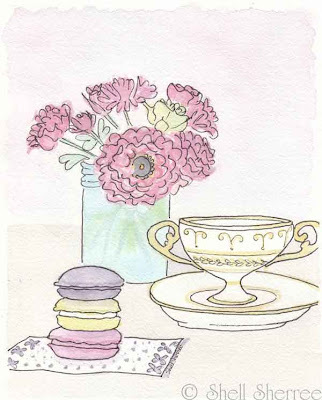 Oh, why bother when I can join you for tea, macarons, and fun? Macarons don't need no stinkin' invite! I am sure someone smuggled some in. You probably didn't notice as you were too distracted by that (no doubt) pink elephant in the room. With lampshade on head. Red, white, & blue macarons are on my to do list this weekend. Happy Franco Macaron Fryday, ShSh! Absolutely beautiful, as ever, Shell. We were all so distracted by the flowing wit and bonhomie that we never even noticed the omission, though now, of course, we realize why we suffered a few inexplicable pangs that evening. I would definitely enjoy myself at this table. Can we add some wine? Oh! my Shell now I am content - with macarons in pretty shades of sweet violet, framboise and french vanilla - with the lightest crunch to the first bite then soft and delectable inside. I must confess I have never tasted Assam Harmutty Estate tea - must go fossicking in little salons de thés. Lovely illustration! Have a lovely weekend. Cali ~ you know me so well. Put an animal in the vicinity and I'm instantly distracted by it! Cafe ~ that's a very fine and appropriate quest. Would the blue ones be blueberry flavoured? Counting the sleeps, Alexa? I'm very excited for you!! Thanks, dear Mise ~ I'm glad it wasn't as negligent as I worried it might be. Dianne ~ I haven't tasted it either, but the elephant seems very taken with it. Reminds him of home, perhaps. Ms M ~ wishing you a happy weekend, too! So glad the macarons didn't take it personally not being invited to last week's party. They seem to be in fine form here! (They obviously are the life of the party as it took me a few moments to notice the gorgeous tea cup and pretty flowers.) I had some sparkling wine tonight with tapas; I think macarons and sparkling wine would go very well together, so I'll bring a case of the bubbly to this party! I did not need a macaron, but that doesn't mean I did not want a macaron. Your comments make me smile as much as your painting. Katie ~ I trust your taste without reservation. Bring it on! Thank you, Debs! Bringing you a smile makes me happy. I love the details on that gorgeous cup. 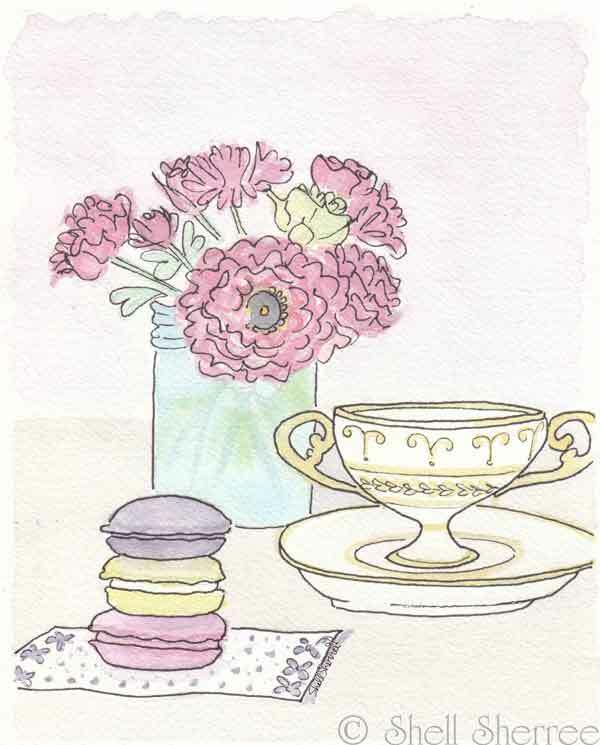 I can't wait to sip some tea out of it and nibble on a macaron - or three. You have more than redeemed yourself for the initial oversight. Mouth-watering, Shell. I see there are only three macarons, though, which is the perfect number for me, but where are everyone else's? Pop Culture Nerd ~ ssh, you'll draw the waiter's attention. There are Ladurée boxfuls stashed in a tote under the table within easy reach. No need to pace ourselves. It was, Vicki ~ all seems right in the world now. I so hope we find a house to buy soon, so I can buy some of your lovely prints for the walls! Lovely to see you, Kathryn! And thank you, I'll be honoured when the time comes.